HI all. Well its that time of year....getting my 2003 Chappy 29 ready for the upcoming season and looking to upgrade my sound system with new speakers, sub-woofer and amp. any suggestions? Kicker KMXA8005 amp to drive it all. Comes with ShocWave wireless sub level controller. Do you carry all this stuff in your store? Can you order online? How about cameras and video equipment, do you carry that shhtuff? Link? 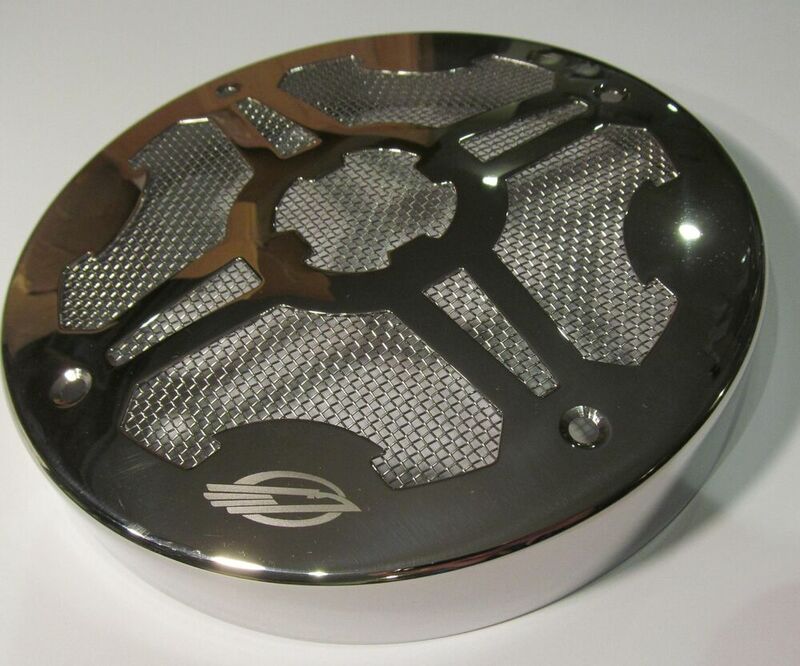 I'd like to upgrade my stock, plastic speaker covers with the new, LED chrome ones with the Chaparral hawk logo. Not sure if they exist. Sorry, didn't realize my inbox was full. I just deleted a bunch of stuff, should work now. Thanks, Wylie. So these would be a great replacement. Not sure if those are LEDs that are shining or just a bulb reflection. I've got a real mess on my hands. It's compounded by my absolute ignorance of amplifier wiring, and the very difficult job of routing the NMEA2K backbone to the cabin behind/under the lounger seat. I am replacing my Clarion CMD-5 with a Fusion RA70N head unit and two new remotes and putting them on the NEMA2K network. The Clarion setup consisted of the head unit, two wired remotes, a Alpine PDX-5M amplifier, two stock speakers in the cabin, two stock speakers in the cockpit, two cockpit subs, two radar arch speakers and two speakers on the swim platform (10 speakers/subs altogether). There is also an additional three knob control at the helm. The middle knob at the helm controls the volume of the arch speakers, and the other two are (I believe) tone control. One may manipulate the volume of the speakers on the swim platform, but I'm not certain. I rarely adjust them via those knobs. Because of all these after market features, I am completely confused on the wiring. I have the head unit connected to power, cabin speakers, amp trigger, and the two arch speakers, but I cannot figure out the connections for the amp that powers the remaining cockpit and swim platform speakers. Checking the amplifier (which is installed behind the cockpit cooler insert), it has no lights. I've checked and verified 12v power to the amp, but I get no power indicator lights (there are two lights, and a small LCD screen). It should be noted that I do have the blue remote amp wire connected to the head unit. Before I attached it, there was zero sound from the arch speakers, but after attaching it, I get sound. That initially made me feel like the amp was powered, but then I decided that maybe it simply completed a circuit and the arch speakers were somehow bypassing the amp? Does that even make sense? Not sure anybody here can help me with the wiring without looking at it, but I do believe I need a new amp. I have checked the two 30 amp fuses on the amp and they appear to be intact. Is there any other way to test am amp before I buy a new one? I'll probably go with the one Wylie suggested above unless I can somehow test this amp. Any thoughts? Are you talking about the Alpine PDX-5M amplifier? What color are those two lights you're referring to, blue & red? If the blue one is on, then it's working fine. Enlarge and scroll down to Figure 9 in switch settings and item #18 shows you the indicator lights and to the right is the working status graph. Yeah, there's the square "badge" light in the middle, plus red/blue lights on the corners. None of them are illuminated although I'm getting 12v across the inputs and the fuses appear to be good. I'm going to test the amp on the boat one more time, then bring it home and bench test it, but I think it's dead. Wylie has been helping me offline, so I think I have a good roadmap to follow. If the amp is dead, I think I'm going to go with his advice and get the KXMA800.5. What a cool little amp! I think and who am I. Is get some paper, draw out what your head unit, amp and remotes in a block diagram. Than go back to the each manual for the inputs and outputs to where they are going to each block. Use different colors to keep it straight in your mind. Set up two or three of these, one for speaker wires and one for power and remotes in order to keep it simple. OR what ever works for you. I am sure the kicker amp is a great amp. But you might want to stick with Fusion. There support is very good and they try to make it simple. I'm going to take some long RCA leads to the boat and connect it directly from the head unit to the amp for testing purposes. I am also considering the possibility that the sound I am getting from the arch speakers is possibly from a second small amp hidden somewhere. I just need to trace everything out and yes, on paper as you suggested. I may have a situation where I THINK I am connecting the main amp turn on wire, but in fact it may be this second phantom amp that is powering the arch speakers. If that is the case, I should be able to switch off the remote turn on feature, and the amp may just light up. That will confirm that I have the turn on lead from the head unit connected to the wrong amp. Again, I am just guessing being an hour away from the boat for a week, but my mind won't stop churning over it. Where you buy something should actually be your first line of support. Like when buying a new Chaparral, would you call the factory for questions? Factory support can be a bonus. With that said, you would want to know the coil configuration of the two woofers, prior to choosing an amp. Fusion's (or anyone's) factory support wont be much help, if you go with the wrong replacement amp and then have an issue upon installation. Didn't have to call a professional (just yet)! Turns out the amp was just fine. I hadn't connected the turn on line to the head unit. I thought I had because when I connected what I thought was the turn on wire, I got sound out of the arch speakers. Turns out, that wire was just for those speakers (maybe they have their own built-in amp?). So I traced the wire from the amp to the cabin and crimped it onto the same wire as what powered the arch speakers and the amp lit up! Now I have 8 speakers working just fine. Cannot figure out the subs, but I know they are wired correctly at the amp because when I apply the same source to the sub inputs, I get good sound through the subs. But when I use a y-adapter for the single sub out on the head unit, the subs produce nothing. Going to have to research that a bit. The three knobs at the helm are volume control for subs, cockpit speakers, then swim platform speakers. Not sure how they accomplished the wiring for this setup, but they work just fine (with the exception of the sub...although it worked fine when I introduced the main output to the sub inputs). Just gotta figure out how to get the mono sub signal to the L/R sub inputs. Obviously it's just my lack of understanding, but I'm determined to figure it out. So I traced the wire from the amp to the cabin and crimped it onto the same wire as what powered the arch speakers and the amp lit up! No No No! Speakers and amp turn-on are not the same wire. Turn-on is blue or blue/white and no other color. Speakers are Gray, White, green and Purple, no other color. You need to correct this before you blow something in the head,like its internal amp if it is indeed a speaker lead you are connected to. Head unit wire colors have been standardized for a couple decades. Just google head unit wire harness colors and you will get a layout. Sorry, I wasn't clear. The amp's "turn on wire" (which is actually red...aftermarket) is connected to the Fusion's blue "turn on lead", so all is good. The turn on wire for the arch speakers was a blue wire from the wiring harness and is now connected to the same Fusion turn on lead. I am surmising that the arch speakers have a separate hidden (or built-in) amp because the blue wire connected to the Fusion's turn on lead makes them operate. The actual speaker wires for the arch speakers are RCA plugs and connected to the Zone 2 output leads on the head unit via a y-harness so that the same output is sent to the amp and therefore the speakers that are attached to the amp. I doubt your arch speaker are self powered, so there must be another amp somewhere. RCA's are not speaker wires, but rather low voltage audio signal supply. RCA's are not speaker wires, but rather low voltage audio signal supply. Yes, I'm sorry...I meant audio signal supply. Just my (VERY) novice radio vocabulary. Thanks for your help, though. GREATLY appreciated! JL Audio rocks !!! Check out Crutchfield. I bought from them subwoofers for the house, just when I was working on my assignment in acoustics in physics, and I can say that the quality is excellent.